Heading up Internal Medicine, Dr. Clayton Kilrain believes in the team approach in providing the best patient care. The team includes the primary care veterinarian and the specialists at the Center but revolves around the pet owner. After receiving his DVM degree from the University of California-Davis in 1984, he did an Internship and Medicine Residency at the University of Pennsylvania. Board-certified in Internal Medicine, he has presented original work at the annual ACVIM Forum as well as authoring papers in the JAVMA. Serving as President and President-elect of the WPVMA he has been actively involved in promoting veterinary medicine. With his wife Sharon, he is active in the dog community, both training and showing their Golden Retrievers in Obedience, Tracking, Field and Agility and as members of the Potomac Valley Golden Retriever Club. The constitution of ACVIM states: “the primary objectives of the College shall be to advance veterinary internal medicine and increase the competence of those who practice in this field…” As Diplomates of the college we dedicate ourselves to the pursuit of excellence and “promoting continued professional development as an obligation of membership.” The process of becoming a Diplomate is long and requires commitment and dedication. The Internship and Residency prepares the candidate for the challenges of the unusual or tough cases. Publishing papers and preparing case reports ready the internist to critically assess and evaluate the explosion of new information and to keep abreast of the latest developments. The exhausting and comprehensive examinations assure those relying on the Diplomates’ expertise that they can trust them to do their best. The process takes an average of five years or more to complete and is an accomplishment to be proud of…and I am. Internal Medicine, true to the name, is primarily dedicated to diseases of the internal systems but may on occasion involve the skin or eyes. Areas typically handled by internists include the nervous system, cardiovascular system, respiratory system, digestive tract, urinary tract, liver and pancreas, endocrine (hormonal) systems, hematology (blood), as well as cancer. Examples of problems for which your veterinarian might refer your pet to an internist are seizures or paralysis, heart failure, coughing or asthma, chronic vomiting or diarrhea, kidney or bladder disease, hepatitis or jaundice, pancreatitis, diabetes, thyroid disorders, anemia, bleeding disorders, and evaluation or chemotherapy of cancer. These kinds of diseases can be the most serious and frightening of problems and also the most frustrating. Why does my pet need a specialist? Most of the time, your pet’s problem can be handled quickly and effectively by your regular veterinarian. But on those occasions when the answer is elusive or the condition persists it may be time to consult a veterinary specialist. Specialists bring a greater understanding in a particular area of expertise – knowledge of the unusual, the uncommon or the rare. In addition, the specialist will have equipment not generally available. How will you diagnose my pet’s condition? While we maintain the latest in diagnostic and therapeutic capabilities we realize that the greatest asset of a specialist may be the knowledge and experience they bring to the problem. A careful evaluation of the work already completed by the primary care veterinarian as well as input from you the owner and a thorough physical exam will allow us to formulate the options. 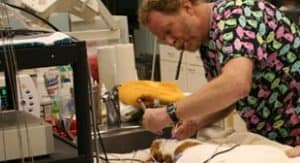 In consultation with the primary care veterinarian these options can be explored and the most compassionate and well thought out course of action can be initiated. A sample of the procedures available to diagnose the challenging cases include both thoracic and abdominal ultrasound, endoscopy for gastrointestinal disorders and respiratory problems, bone marrow biopsies for hematological assessment, biopsy needles for less invasive biopsies of masses and some internal organs, laparoscopy for examination and biopsies of abdominal problems without open surgery, CSF taps and CT scans for neurological diseases, myelography for spinal problems and blood pressure determinations for detecting both hypertension and low pressures as well. Making the diagnosis is only half the battle. Once the diagnosis is known the next questions can be answered—such as… is it treatable?…what is the best treatment?…what is the prognosis? We endeavor to use the best nurse your pet has, YOU, whenever at-home treatment is possible; but when the case demands advanced treatments we are ready to respond with advanced life support, non-surgical feeding tubes for nutritional support, infusion pumps for constant infusions of vital medications, oxygen supplementation, blood gas monitoring as well as round-the-clock monitoring of other blood parameters and blood pressure all in a dedicated 24 hour critical care setting. In either event, follow-up treatment and monitoring can be coordinated with your primary care veterinarian for the ideal level of comfort, convenience and completeness. With any luck your furry friend’s wellness will make everyone smile. The guiding principle is to relieve the pet’s discomforts while maintaining their dignity.